Purpose: Provide the building blocks for Life. One of the important health beliefs we need to change as we progress towards Premiership Health, is that of genetic determinism – the debate of nature v’s nurture, the genes v’s the environment. Many people have the notion that genes are all powerful and determine how we act, how we feel, how we look, and ultimately our health and happiness. However, ask yourself this question; why are so few Premier League players the offspring of professional Footballers? In the 1990’s, there was a plethora of news stories claiming scientists had found the gene for alcoholism, obesity, depression, homosexuality, even violent behaviour. “it’s in my genes.” ? Unfortunately, this is a great big self-limiting belief because it disempowers you to take control, it makes you feel helpless to change, and when people feel helpless they don’t take action and they don’t make the necessary changes to improve their health. As team manager, just imagine how you would feel if you weren’t allowed to make any team substitutions, or worse still, you weren’t even able to give the players any coaching because everything was under the control of the DNA genetic code. Do you think that would be a good or bad situation for a manager? 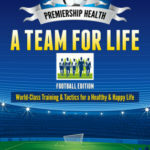 What we have to remember for Premiership Health, is that we are dealing with a living entity, a squad evolving and developing according to the environment in which it lives. We are not just motorcars of different colours, shapes and engines, relying on a mechanic and “one careful owner” to navigate ourselves through this journey in life. We have to take care of, and nurture many diverse, yet interconnected players on our squad rotas, in order to succeed in this game. And, just like a top Premier League team. At any one time, there will be players sitting on the sidelines watching and observing. There will be youth team players, learning from the more experienced pros, there will be players out injured, requiring extra time to get back into action and hopefully everyone will be pulling together, united by a common purpose. This is the nature of a team game and forms the basis for Premiership Health. The key to the play of the GenoTeam, like all your “Teams for Life,” is the environment. By changing the environment of the genes, you change how they play. Play/Life is controlled not by genes, but, by the signals and the environment in which they exist. The reality is the genes are not in control, something else is in charge of the GenoTeam. And to discover their identity we need to unravel the mysteries of epigenetics. (See Training section).